This mirror glass is for the left-hand rear view mirror. This mirror can replace the left-hand rear-view mirror glass on the LR2, LR3, Range Rover Sport, and Range Rover Sport Supercharged models. 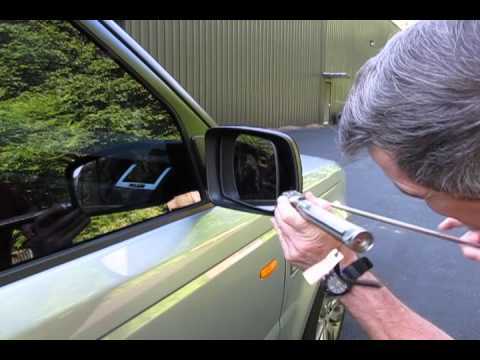 Atlantic British Ltd. Repair & Maintenance Academy How-To Video: Watch Doug as he takes you step by step through the process of replacing the mirror glass in the side door mirror assembly on a Range Rover Sport, LR3 or Full-Size Range Rover. Questions about this video? Call us at 1-800-533-2210 or contact us via live chat. works fine and installs easily. This seems to be more curved (?) than the original that it replaced which took a little getting used to. But this change brings more of the blind spot into view so over all I like the change. This mirror is greatly inferior to the factory mirror. I still have the factory mirror on the passenger side and it is as clear as a bell. The new driver side mirror blurry and distorted. This is my second one and it is only marginally better than than the first. In this, go with the authentic Range Rover mirrors for a clear image. These are off-brand not Land Rover Factory Replacements. Was expecting better quality. Images are distorted towards edges of the glass Passenger mirror does not have "objects in mirror are closer than they appear" etched into the glass like factory ones do. Overall they are OK but are a little pricey for what you get. for a few more dollars per mirror I could have had factory mirrors. lesson learned.